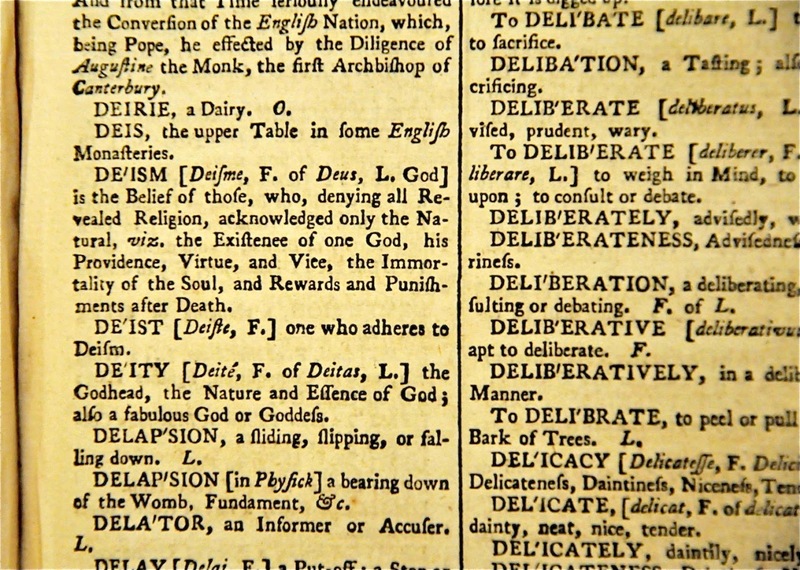 The good people at 18th Century Bibles, through their Facebook page, today posted several definitions of "deist" and "deism" as published in The Encyclopedia Britannica in 1770 and An Universal Etymological English Dictionary of 1761. "Deists, in the modern sense of the word, are those persons in Christian countries, who, acknowledging all the obligations and duties of natural religion, disbelieve the Christian scheme, or revealed religion. They are so called from their belief in God alone, in opposition to Christians. 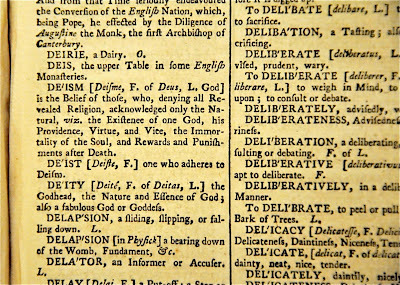 The learned Dr Clarke taking the denomination in the most extensive signification, distinguishes deists into four sorts. 1. Such as pretend to believe the existence of an eternal, infinite, independent, intelligent Being: and who teach, that this supreme Being made the world, though they fancy he does not at all concern himself in the management of it. 2. Those who believe not only the being, but also the providence of God with suspect to the natural world; but who, not allowing any difference between moral good and evil, deny actions of men; these things depending, as they imagine, on the arbitrary constitutions of human laws. 3. 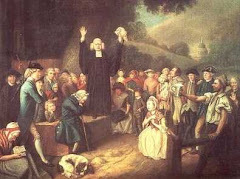 Those who having right apprehensions of God, and his all governing providence, and some notion of his moral perfections also; being prejudiced against the notion of the immortality of the human soul, believe that men perish entirely at death, and that one generation shall perpetually succeed another, without any future restoration or renovation of things. 4. Such as believe the existence of a supreme Being, together with his providence in the government of the world, as also the obligations of natural religion; but so far only as these things are discoverable by the light of nature alone, without believing any divine revelation. 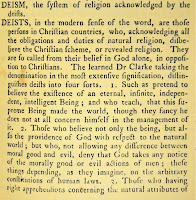 These last are the only true deists; but as the principles of these men would naturally lead them to embrace the Christian revelation, the learned author concludes there is now no consistent scheme of deism in the world." "Deism... is the Belief of those, who, denying all Revealed Religion, acknowledged only the Natural, viz. the Existence of one God, his Providence, Virtue, and Vice, the Immortality of the Soul, and Rewards and Punishments after Death." Also pretty much considered a unitarian. 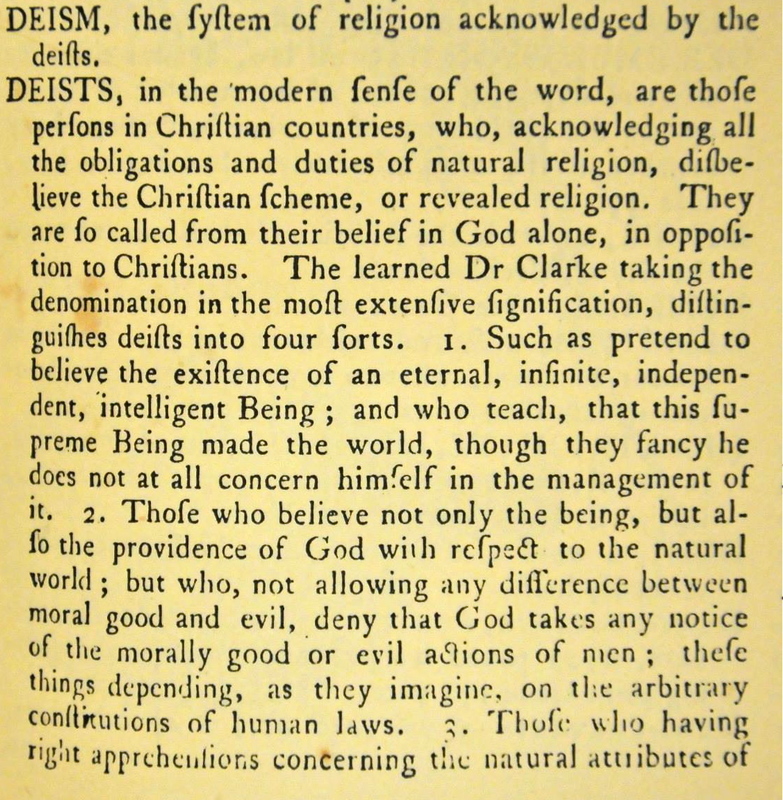 However, if we're to read Clarke here as being critical/dismissive of deism, it indicates the spirit of the times, that unitarianism was the true Christianity, and certainly argues against lumping non-Trinitarianism and deism together, as a sort of "theistic rationalism." BTW, Clarke's metaphysics is in same neighborhood as Thomas Aquinas's. A question [a bleg] is the somewhat slippery term and concept of "providence." One can argue "providence" as the Deity's Master plan, which once put into motion, unfurls perfectly without further ado, and could conceivably be the Plan of the Blind Watchmaker. But "providence," as often used by the Founding generation, say GWash, is closer to the Pillar of Fire that led Israel out of Egypt, which he calls an "invisible hand," and the "wonder-working deity." "However, Voltaire reports that Bishop Gibson effectively prevented Clarke's elevation to the see of Canterbury by pointing out that Clarke was indeed the most learned and honest man in the kingdom, but had one defect: he was not a Christian." Yes, the clergy definitely made those distinctions. That's their job. Normal people, not as much. Roman Catholics aren't Christian, you see. This is how these people think, Jon. Keep that in mind when our friend GF plays the "who is a Christian" card. I know; but for Frazer, it's more the Trinity and other cognate doctrines derived from the ecumenical Trinitarian creeds to which the vast majority of the late 18th Cen. American Christian churches subscribed. 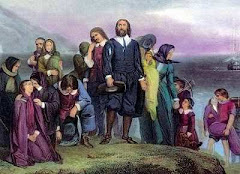 Roman Catholics, to Dr. Frazer, are "Christians" for late 18th Cen. American history purposes, but not for his personal theological purposes (in that sense he agrees with Sproul). Mercy. Keep that in mind when you quote one clergyman against another.